Efforts to solve the Monterey Peninsula’s (Peninsula) water crisis took a crucial step forward following the release of a long-awaited Environmental Impact Report (EIR) and Environmental Impact Statement (EIS) for California American Water’s (CAW) proposed desalination project. The desalination plant is one of three major components of CAW’s proposed Monterey Peninsula Water Supply Project, which also includes wastewater recycling and aquifer storage recovery components. 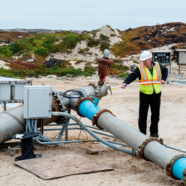 CAW’s desalination plant, which will be financed through both private and public funding, is a 6.4 million-gallons-a-day facility north of Monterey that will pump treated water through an eight-mile long pipeline south into the Peninsula. 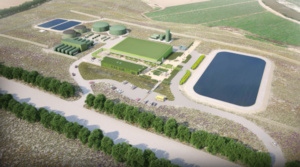 The plant will use slant-well technology that will draw water from the shallow and brackish aquifer just inland from the coastline. This approach will avoid nearly all impacts to sea life and was required by the California Coastal Commission to be explored as a first option over open-ocean intakes. CAW had already been running a slant test well in the area for the last two years. The California Public Utilities Commission and Monterey Bay National Marine Sanctuary conducted the EIR and EIS, respectively. The issuance of these comprehensive documents represents the most significant milestone to date for CAW’s project. After years of public debate and commentary, Peninsula residents and interested parties finally have comprehensive and objective, science-based documents to review and make informed decisions. The effects of constructing and operating the Monterey Peninsula Water Supply Project on the surrounding environment. The need for a new water supply. Which project will have the least impact on the environment. The Peninsula has been subject to a cease-and-desist order from the State Water Resources Control Board mandating CAW to drastically cut back pumping of the Carmel River, which comprised nearly 70 percent of the Peninsula’s historic water supply. The order also prescribes a series of strictly enforced project deadlines to ensure the timely development of an alternative water supply. To date, CAW has successfully met all the state-required and self-imposed milestones. The release of the EIR/EIS is considered among the most critical milestones, allowing CAW to check off two very large boxes in the process of obtaining state and federal approvals.